With this release we're very glad to introduce Ibakusha and his music. During these years Manuel has developed an articulate style of composition through many different types of inspiration, but the most significant influence is, without any doubt, the sound of labels like Merck, Skam or n5MD...somebody calls it idm, but this genre is definitely too tight for Ibakusha's music. He finally collects these six tracks into "Novctzember", his debut, an album full of inspired songs, warm melodies, deep pads and nice beats, plus some "disturbing" elements. Those "disturbing" elements give his music something really special, something you don't expect; the lofi guitar riff in "Taxifolia", the intense cello during "Fripées" or the exploding rhythm on "Asperité", all essential components of the entire ep. Novctzember will bring you through an intense listening of very distant music atmospheres, from the gentle harshness of "Asperité" to the dilated "46.67", the emotional intensity of "Fripées" designed by the cello and "Taxifolia" assembled with a freaky guitar and an ultra compressed beat that will make your subs tremble. Unique! The last two tracks are the resume of the entire disc "Souffle Buée" has an old school idmish strucure floating over ambient pads, and "Chlorophylle Rouge", one of the best songs of the ep, takes you to a gentle end. Manuel manages perfectly the intensity of his music with particular structures where the song acme hangs on for a moment and then is released, creating a sort of perpetual climax. Download ZIP file from zymogen. This work (audio tracks, cover, text) is licensed under a creative commons license. Dieses kommt von Ibakusha aus der Schweiz und verwirrt den Hörer elektronischer Musik mit einigen schönen und unkonventionellen Ideen. Zymogen setzen Manuels Musik durch Vergleiche mit Skam und n5MD in den Referenzrahmen IDM/ Drill'n'Bass, betonen gleichzeitig aber die Andersartigkeit seiner Kompositionen. Wie wahr! Schwingt im ersten Song "Asperitè"; noch ein Hauch Squarepusher-Breakbeat mit, so gelingt es Manuel bereits hier, durch verzerrte Vibraphon- oder Spieluhr-Klänge eine Atomsphäre unkitschiger Wärme zu erzeugen, die von gefühlsduselnder Indietronika weit entfernt ist. Vollkommen überraschend ist dann der Einsatz des schweren Cello-Motives in "Fripèes". Der Song ist in weite Hallräume gebettet und wird neben dem genannten Streichinstrument von dezentem Noise getragen. Synth- und Piano-Patterns verlieren sich zartbitter und ambient im Delay... Tief und ergreifend. "Taxifolia" danach schockiert mit dem konsequenten Einsatz einer elektrischen Gitarre. Neben den oben genannten Einflüssen zählt wohl auch der 80er Gitarren-Untergrund zu Manuels Inspirationsquellen! Denkt an And Also The Trees und andere Düster-Waver. Interessanterweise fügt sich auch dieses disparate Element sehr harmonisch in den Gesamtfluss ein. Track Nummer Fünf, "Souffle Buée", wartet mit einer schönen Spannungskurve und großer harmonischer Dichte auf. Wenn euch dieser Vergleich etwas sagt: mich erinnert das sehr an den Eis-Level in Donkey Kong Country (Super Nintendo), in dem die musikalische Untermalung mit zunehmendem Schneetreiben immer bedrohlicher wird. Ganz großes Tennis! "Cholorphylle Rouge" und "46.67 6.32" klickern und klackern solide, ohne die Dramaturgie der EP zu verwässern. Das zudem gewohnt schöne Artwork mit seiner ästhetisch-botanischen Studie repräsentiert "Novctzember" eigentlich sehr passend: Organisch, versponnen und bei aller Sanftheit irgendwie seltsam. An dieser Stelle sei auch noch mal auf das zweite Zymogen-Releases Diatribes hingewiesen: harsche Live-Elektronika und tonaler Freejazz Hand in Hand, eine meiner Top-Five Veröffentlichungen 2005. Tolles Label, tolle Musik! 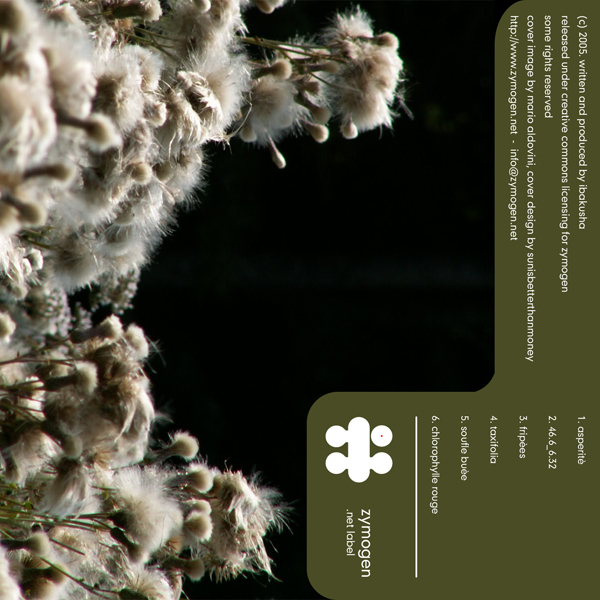 italy-based netlabel zymogen got a new record out! it's their fourth release, and it looks like these guys are willing to make you remember the name. after the stunning diatribes-record last year, it's ibakusha from switzerland with his novctzember EP the label serves for you. electronic music, once again. but don't stop reading! manuel has some great ideas to make his music more interesting than most of the other releases i've heared. at asperité, the first song, he expands some nice textures of dirty synths and adds a click here, adds a cut there. along with a distorted, melodic glockenspiel-pattern, trashing breakbeats explode in your headphones. cool, surprising and referential. astonishment nr. 2: fripées features a heavy cello-line. hunting track with delayed piano and a lot of background-sound whirling somewhere below your attention. at track four (taxifolia), beats become a bit more concrete. ibakusha drops a processed motive of electric guitar over his production that makes you think of 80s indie-pop like and also the trees and similar. strange thing how all these 'real' instrument fit into the electric environment like it's nothing special. last song to mention: chlorophylle rouge. ibakusha combines his romantic piano-play with smooth breakbeats, let's say squarepusher 1998, and a lot of low key noise. great composition, dense atmosphere, the perfect last song. very well done, manuel! das vierte release von zymogen reiht sich nahtlos an die vorigen an. mit schönen flächen und warmen melodien werden entspannte momente geschaffen. ein lofi-gitarren riff oder sogar ein cello sorgen ebenso für kleine überraschungen wie explodierende rhytmen. (un)aufregende mischungen sorgen also für eine wohlige athmosphäre!